Discussion in 'GS Boxers' started by Warthog, Apr 10, 2008. Received my HP2 wheels from Woody's. They made it halfway around the world to Korea without a single scratch. They won't stay perfect for long! The blue color matches the frame...I didn't expect that. Maybe I won't have to paint the frame. 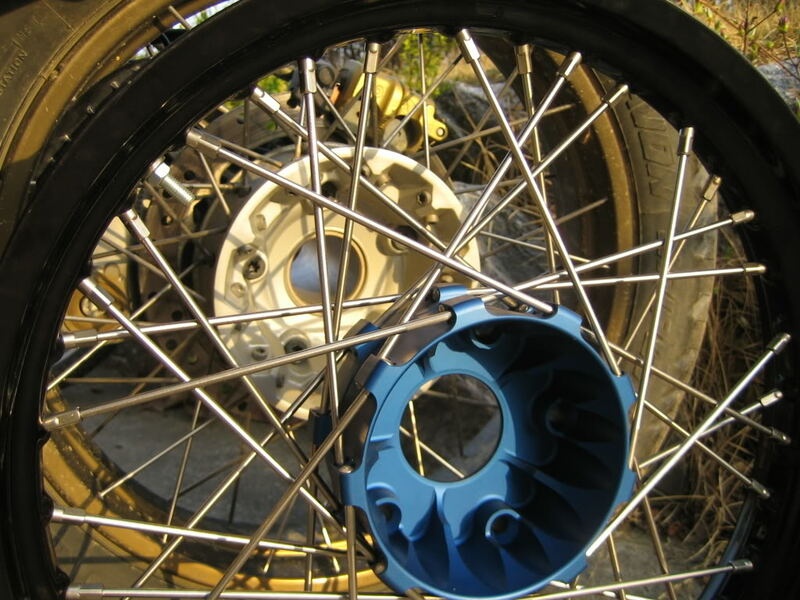 Note the reduced diameter of the front hub, and the reduction of mass in the body of the hub. Woody gave me a woody! My my my, that is simply gorgeous. 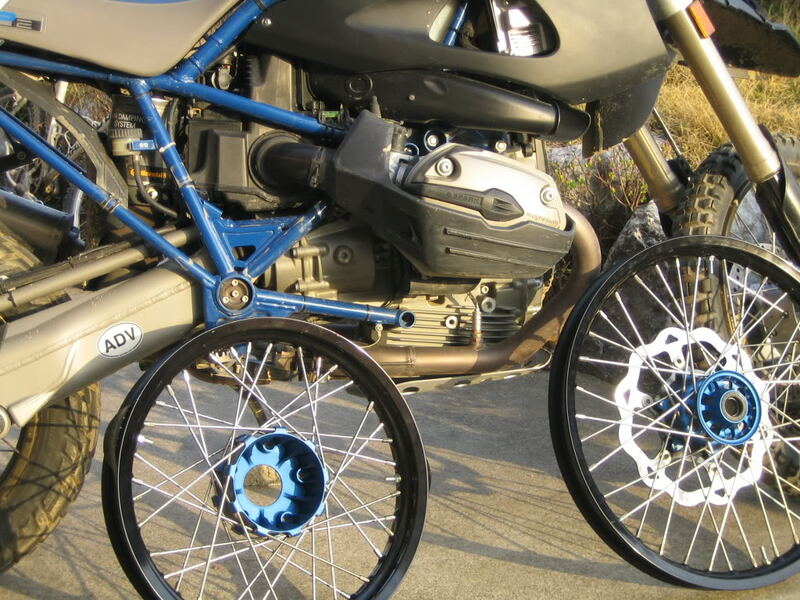 I'll never be able to afford those hubs nor the bike those go on, however I can appreciate the artistry that created them. YEP, me too! Sure is bike pron at it's very best, nice, nice stuff. I'm trying very hard to spend any more money on my HP2... you're not helping!! One serious question - I understand that wavey discs are meant to help cooling and help with clearing any dirt out... but they look a lot thinner, having less surface area in contact with the pads. Will there be less stopping power on the front? Not criticizing - just curious. 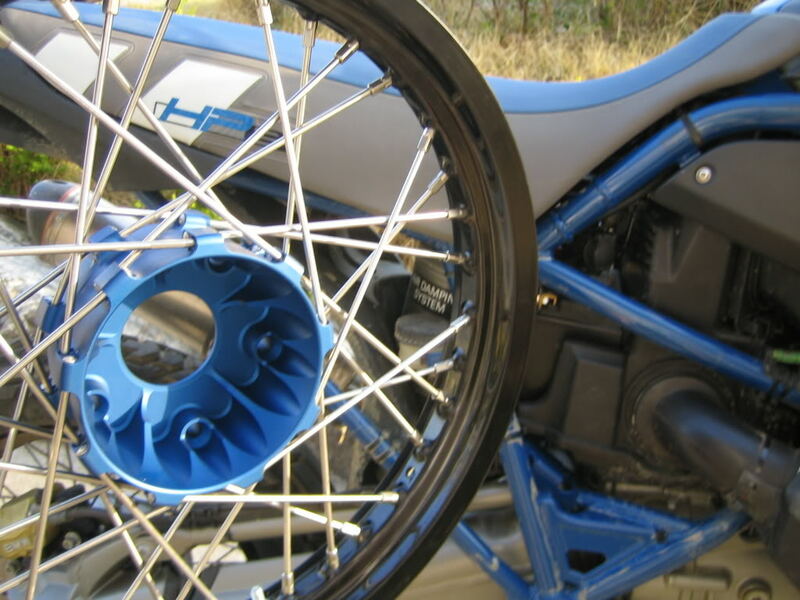 Both hubs are custom cut and drilled from solid aluminum. Woody the Wheelbuilder and Mike the Machinist fabricate them from scratch. 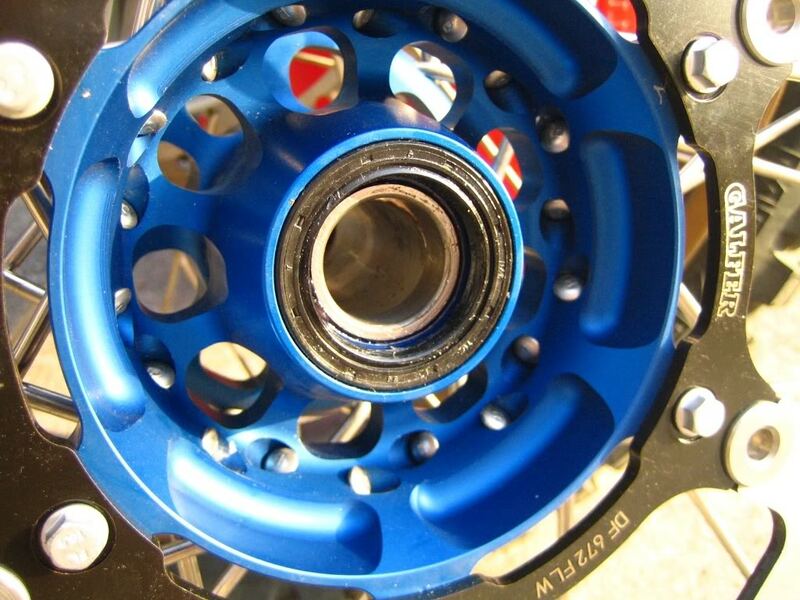 I believe the OEM hubs are formed in a mold, not cut from billet aluminum. I'm not sure how the Galfer rotor will stop. The Galfer package says to use Galfer pads...but that is not surprising. 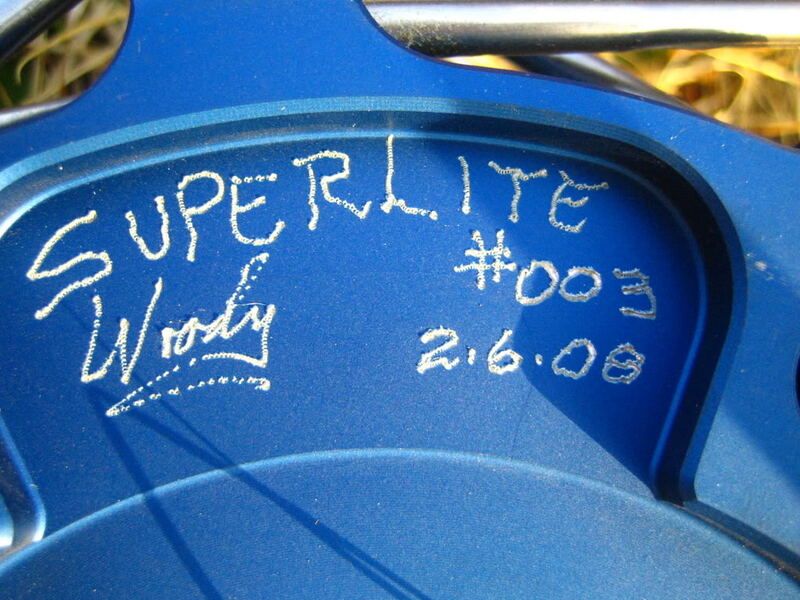 I trust Woody and Chris to send a rotor that will stop this beast with sufficient haste. If there are concerns, I'll post. The Galfer packaging claims the rotor is lighter and releases heat faster...faster than what, I don't know. If it is lighter, that is great. Any reduction in rotational mass is a bonus, especially on that 21inch front wheel. I come out of the dirt onto the pavement, accelerate, then try to flick the bike in to a turn...and the front wheel doesn't want to heel over! Thanks for keeping us updated - be interested to hear how much easier you find it turn on the dirt rims now as well. Chris is doing me a pair with black hubs. 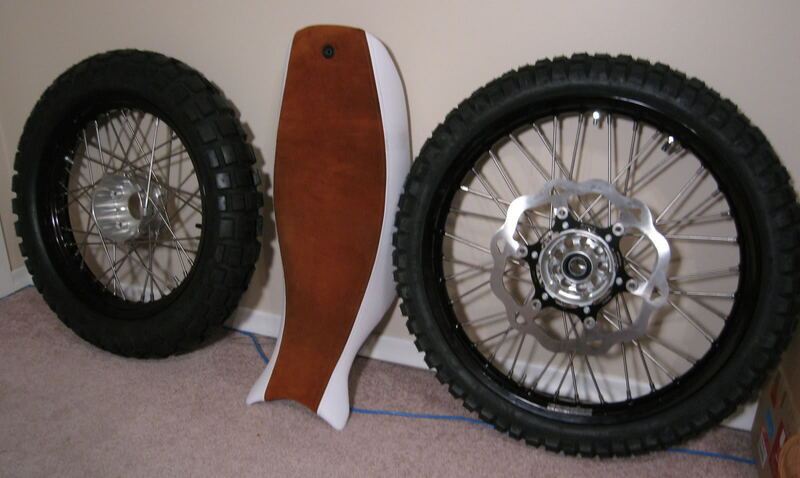 Will post a picture when they are on the bike....Yours look great! I´m Markus from Germany. Do you have an adress of woody? 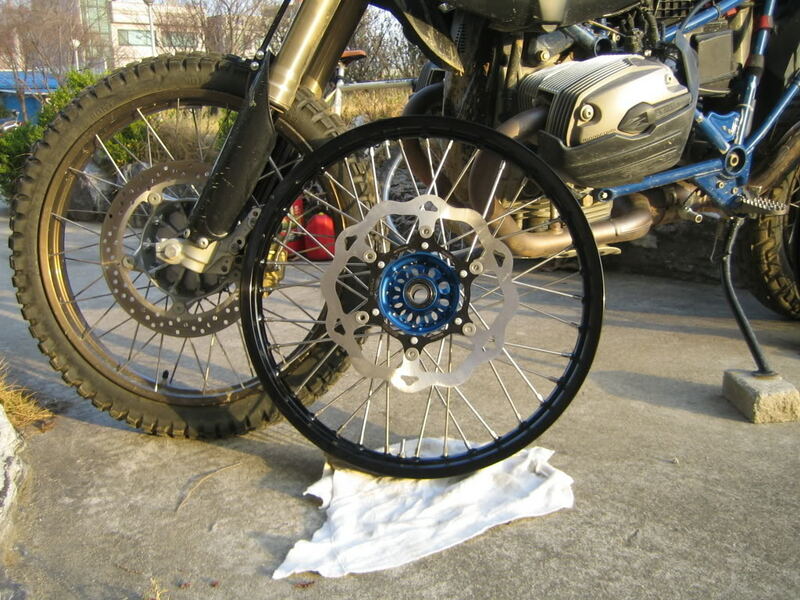 Can he make hubs in the size of the 1200 GS for the HP2? Can you give us an idea of how much these wheels cost? I know they are premium items, so am not expecting them to be cheap, but knowing would help me to decide if I should try to buy some or not. a veternarian in Vermont finally put the finger on it.. a severe case of Sleep Apnea was turning me into a zombie for want of a better description....anyway a sleep study and CPAP machine has turned the tide..i'm out of the fog...contact me. I'd love to do both but I have to go to Tuscany with the old lady in exchange for my fortnight off. A set of Öhlins and change to spare will be on the bill for that trip.